X10 well-known as producer devices for home automation over electric wirings, recently launched its own Android Tablet called AirPad. 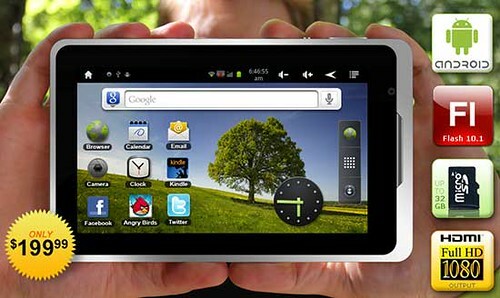 For $199.99 you get 7 inch Android 2.3 powered tablet with 1.2 Ghz Rockchip 2918 Cortex A8 processor, 4GB memory + up to 32GB with microSD card, a built in camera, microphone, speakers, WiFi adapter. Not bad for that price isn’t it? The main application of the X10 AirPad in my mind is control console of smarthome system. It can be mounted to the wall or used as mobile remote control. IпїЅпїЅm unclear why but this web site is loading extremely slow in my position. Is anyone having one of these issue or possibly it a predicament on my end? IпїЅпїЅll look later and see if the problem still exists. Theres noticeably big money to learn about this. I suppose you have made certain nice points in options also. I never thought of this doing this, well put! I found your blog using yahoo and must say, this might be the most effective well composed articles Relating to viewed with a while. I’ve got bookmarked your webblog for additional posts. We are eager for the commencement of my college research and then the general planning will not have already been complete without dropping by your website. For a demanding blogger Ii?1m dazzled to discover others taking initivative and adding to the town. I would like to verbalize i always haven’t reviewed something so exciting shortly. There’s lots of motivating ideas and opinions. Maybe that you choose to absolutely located an vital fact and so i signed up to your RSS to remain well-versed. I got excited to search for this internet-site.Need be to interesting time in this excellent learn!! This product results in great reading. Its filled with useful information thats interesting,well-presented easy to find out. I enjoy articles who are well done. This may be a truly great read for my situation, Will want to confess that you will be one of the greatest bloggers I ever saw.Appreciate your writing this informative post.